Yesterday, the Senate Banking Committee held the first of its hearings on widespread demands to reform the Federal Reserve to make it more transparent and accountable. One of the key reasons that the Fed wanted to keep this information buried from the public is that Citigroup was insolvent during the period it was receiving loans from the Fed. There is also growing distrust of how some Fed personnel appear to cozy up to Wall Street. During Federal Reserve Chair Janet Yellen’s appearance before the Senate Banking Committee a week earlier, Senator Warren severely criticized the actions of Scott Alvarez, the General Counsel of the Federal Reserve. Warren said Alvarez had delivered a speech before the American Bar Association challenging Dodd-Frank’s so-called push-out rule that would bar insured depository banks from holding dangerous derivatives and swaps on their books. Not long thereafter, Citigroup slipped a repeal of the provision into the must-pass spending bill that would keep the government running through this September. 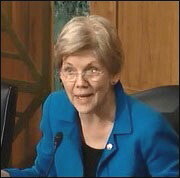 Warren noted that the Dodd-Frank legislation was passed in 2010 but the Fed had stalled the implementation of the push-out rule until 2016 – long enough for Citigroup to eventually have it repealed, a feat which it has now accomplished. Warren also revealed that Alvarez was stonewalling her office in making his findings public on his investigation into a leak of information from a September 2012 Federal Open Market Committee (FOMC) meeting. 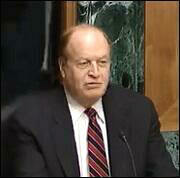 The Senator noted that Wall Street firms can make significant profits trading on leaked FOMC information ahead of public disclosure. Warren said the public was still waiting two and a half years later for Alvarez to disclose the details of what occurred. Given the public’s disgust with President Obama’s Wall Street appointments, this hardly seems like a solution that will curry favor with the citizenry. A far more pragmatic solution would be to strip the Fed of any regulatory role and let it get back to its Congressional mandate of setting monetary policy. Paul Kupiec of the conservative American Enterprise Institute who appeared on the panel said that moving the market desk from the New York Fed across other regional Fed banks would help to diversify the New York power base. Conti-Brown said that anything that would deemphasize the influence of the financial institutions in New York would be good. The other two panelists, Allan Meltzer, Professor of Political Economy at the Tepper School of Business at Carnegie Mellon and John Taylor, Economics Professor at Stanford University, agreed with the assessment that the New York Fed has too much power. The full written testimony of the panelists can be accessed below.